Mega hero Allu Sirish’s upcoming entertainer Okka Kshanam has completed its censor formalities and the movie received U/A certificate. Directed by VI Anand of Ekkadiki Pothavu Chinnavada, Okka Kshanam is now all set for grand release on December 28th. Censor officials have all praises for the makers for making an edge of the seat thriller. Okka Kshanam focuses on an intense conflict between love and destiny. Glam doll Seerat Kapoor and 'Express Raja' fame Surabhi have played leading ladies whereas Srinivas Avasarala essayed a prominent role in the romantic action thriller film laced with an element of science fiction. 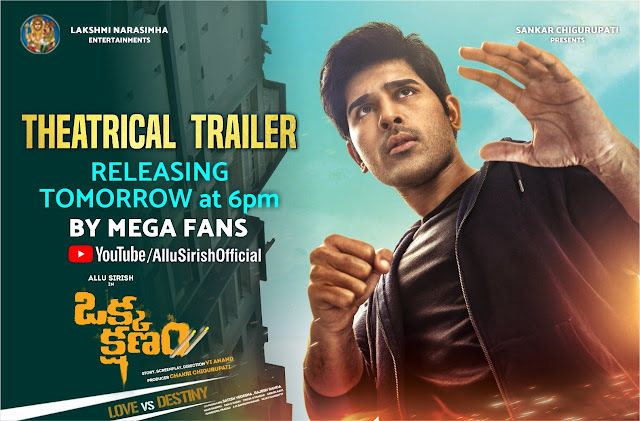 Made with a first of its kind subject, Okka Kshanam’s teaser grabbed everyone’s attention. Chakri Chigurupati has produced the film under Lakshmi Narasimha Entertainments. “Get ready for a thrilling ride,” say the makers.